I was actually looking at a group of ordinary dated coins when I chanced upon a very unusual coin. I checked the date and scrutinized the unusual piece and found that it is a little bit heavier and darker than normal. I bought it immediately and hid it inside a capsule. To my surprise, after I carefully studied when I arrived home and placed it under the light and using my jeweler’s loupe, I found out that this is a trial strike of a 1964 Twenty Centavos in lead. Because of the coin’s condition, it is not easy to see the details by the naked eye. The coin was struck using a cracked die, which is reflected also on the details produced on the coin’s surface. The legend, date, and reed are sharp and the coin itself exhibits silver-grayish toning. Some of the other details were affected by the coin’s exposure to other elements and contacts with other coins. The normal coin is struck in copper nickel. This specimen is probably a final die trial, exhibited by some defects on both the obverse and reverse dies. 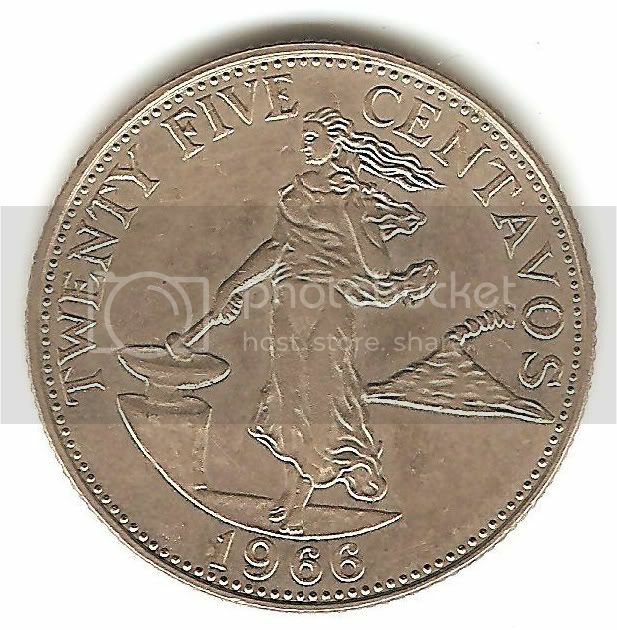 The Sherritt Mint changed the series design during 1966, and it is very recognizable that the coarser figure of the woman is a little bit different from the original design made by Melecio Figueroa. This is the last and final design derived from the original design of the Artist, the series were soon replaced by both the Pilipino banknote and coin series. 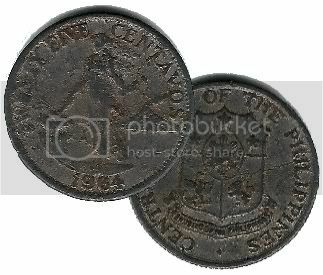 The twenty-five centavos on the other hand was the last obverse die produced for the English coin series before the Philippine Government opted for designs that would feature its National heroes, and the Tagalog-tranlated shield of the Republic of the Philippines.